« I be Africa Man Original! NaijaMade… Coming to a store near you! I finally attended the 2008 Nigerian day parade in NYC and despite the rain, there was a pretty good turnout. I had a great time helping a friend publicize her new social networking website. It was nice to see all the Naija’s in full effect strutting their green and whites all day. 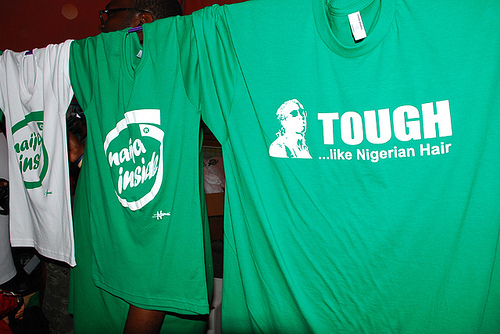 I took advantage of the celebrations to launch NaijaMade: NaijaMan’s T-Shirt line. Many thanks to everyone who bought a t-shirt that day and encouraged me to take this dream to the next level. Send me a message if you’d like to preorder. Update: 04/28/09. The NaijaMade.com v1.0 launched today. Currently carrying just the Naija Day parade selection. We are working on the summer line and will update the online offering shortly! This entry was posted on October 2, 2008 at 3:55 pm and is filed under Naija Dreams, Random. You can follow any responses to this entry through the RSS 2.0 feed. You can leave a response, or trackback from your own site.